A popular community event returns to Petrack Park on Saturday, Oct. 13. Selwyn Harris/Pahrump Valley Times The annual Music and Art in the Park returns to Petrack Park on Saturday Oct. 13, beginning at 9 a.m. The event which serves as a fundraiser, will feature live music, arts and crafts vendors, a beer garden and plenty of food and soft drinks. Petrack Park is located at 150 N. Highway 160. 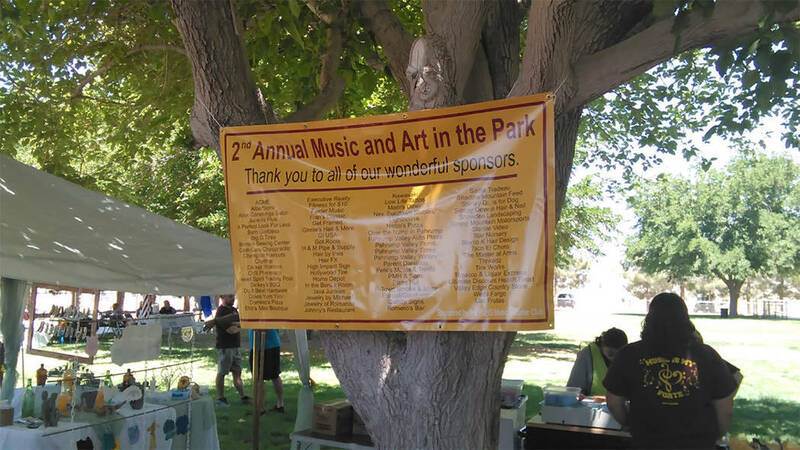 Music and Art in the Park, hosted by the Pahrump Community Choir is a fundraiser for the Pahrump Arts Council and the Pahrump Valley High School band. Additional monies raised will also serve to bring the Missoula Children’s Theater group to Pahrump. Attendees can enjoy live music, purchase numerous arts and crafts on display and browse the beer garden. Food and soft drinks will also round out the all-day event running from 9 a.m. until 9 p.m.
Petrack Park is located at 150 N. Highway 160. Admission to the annual celebration is free.